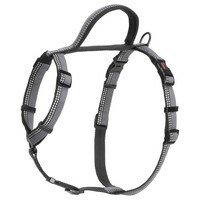 The Halti Walking Dog Harness is a perfect combination of style and practicality for every day dog walking. Made out of a strong and durable nylon webbing that has been stitched with reflective 3M Scotchlite, the harness helps to increase the visibility and safety of your dog, even in low-light conditions. It has 5 points of adjustment to ensure a comfortable and secure fit for any size or shape of dog, and 2 lead clip rings on the dog’s chest and back provide essential points of control. A close control handle on the top allows for instant restraint when necessary.